....something new for you today! Yes....I finally got the chance to stamp today! The Sketch Challenge (SC224) over at SCS was the inspiration for the layout. Although, somehow, I missed putting two panels behind the large focal image. But that's okay. I don't think the sketch police will be knocking on my door. I flipped the sketch on its side and I love the way this card turned out! This card uses the large flower from the Echoes of Kindness set (SU! Level 2 Hostess). I stamped it three times in basic black and colored it in with Cameo Coral and Pretty In Pink markers. I highlighted the stems with Old Olive. The ribbon is black corduroy found in the Valet Ribbon Originals. 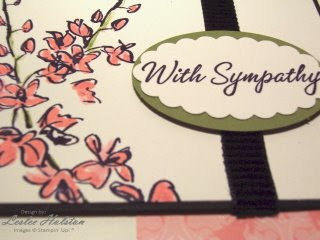 A very simple card with striking elegance! This will be just one of the cards we will make at my Stamp-A-Stack Stash Card Class on Saturday. 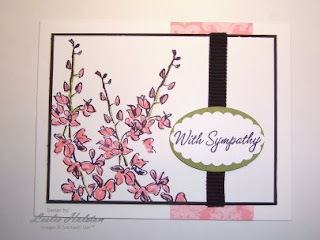 We are focusing on sympathy and get well cards. I never seem to have one when I need it and they aren't the type of card that really want to make. So, if you are local, come join us and we'll have some fun while we add to our 'stash' of cards! Thanks so much for stopping in today. I hope you'll be inspired to give the sketch challenges a try. Come back again soon.